I love growing elephant garlic. You stick a garlic clove in the ground in the fall (Sunnyvale USDA zone 9). In the spring, a tall stalk/scape shoots up. If you leave it alone, a large (5 inch wide) flower head appears. You can cut it off partway up the stalk and use the flower in a vase and the garlic will still grow. When the garlic scape withers and starts falling over, you dig up the clove head. Usually small, pea-sized, clove-lets develop on the sides of the head: Put those back in the ground for next year’s harvest. If you are like me then you have more than you can consume for months. So pickle them! 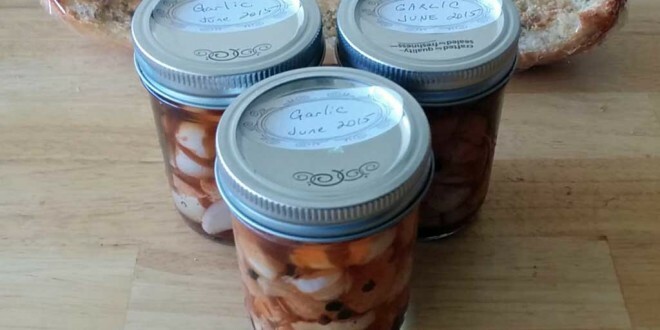 Use the pickled garlic in antipasto or use them as you would use garlic. Blanch and Peel the cloves. The primary purpose of the brine is to create a hostile environment for undesired bacteria. Use vinegar. You can use any kind: white vinegar, apple cider vinegar, red wine vinegar, rice vinegar. Whatever you want. A reminder: they taste different. Add pickling salt. The difference between pickling salt and all other salts is that pickling salt does not make the pickling liquid cloudy. Pour brine into jar up to one-half inch of top. Don’t overfill. The air space is required for effective vacuum sealing. If you overfill, you risk failing to seal the jar. If you under-fill, you expose some of the garlic to air which can shorten the preservation. If your jar fails to seal, you can either repeat the whole process or you can just store the jar in the refrigerator. Boil the jars for the required time.